The AMA has stepped in to take the stand that warm color LEDs are the only products suitable for street lighting. For anyone interested in this, please read it before assuming you know what it says. There are several factual errors in this document. Most in the lighting design business will see them. The LRC has issued a response to this document. The IES has also issued its own response. Again, for those interested, read all of these documents before blowing a gasket and spewing conspiracy theories into the realm, deriding the IES, the LRC or the AMA. It is probably worthwhile also to include the recommendations and statements of the IDA (Dark Skies) as they are the ones who actually initiated the <3000K solution. Nothing shocking here. Not including IES in any of the AMA’s deliberations leading to this document and preparation of this document is perhaps a bit odd. Why would a scientific body not include lighting experts in the process of setting policy on lighting technology? Since the AMA’s adoption of this report, several news channels and websites are carrying reports with varying degrees of information and misinformation about the claims and recommendations within the report …, and the accompanying AMA press release. Of primary concern to the IES is the potential for this report and its ensuing press to misinform the public with incomplete or inaccurate claims and improper interpretations. That’s pretty much the core of the IES response. It does not make any statements of reproach or condemnation of the recommendations, and was respectful that the HoD has the right to set policy as it sees fit. Both of these truly capture the essence of the issue of the AMA issuing a document of authority that is over-simplistic, which can lead to misinterpretation and over-interpretation of points made that cause poor decision making that actually may have a detrimental effect on human health. Residents in Davis, CA demanded and succeeded in getting a complete replacement of the originally installed 4000K LED lights with the 3000K version throughout the town at great expense. This is inaccurate and incomplete. Davis did indeed change the 4000K products. However, they employed 2700K LEDs (not 3000K) in products delivering 15% less light, fitted with accessories that reduced or eliminated glare and house-side illuminance that were not fitted to the original products. This was not a simple CCT change out at all, with glare being as serious a concern being addressed as the light source CCT. In Cambridge, MA, 4000K lighting with dimming controls was installed to mitigate the harsh blue-rich lighting late at night. Even in places with a high level of ambient nighttime lighting, such as Queens in New York City, many complaints were made about the harshness and glare from 4000K lighting. In contrast, 3000K lighting has been much better received by citizens in general. The comment is a subjective statement offered up with no context to the paragraph. The issue of glare and harshness was not redressed. The assertion in the Cambridge application is that dimming was added, but that is not the case. Dimming was part of the original specification. In this case, in their zeal to condemn 4000K LEDs and make the point for 3000K sources, they blew past a significant concept – dimming controls added to all street lighting to reduce illuminance in low use periods, which reduces both human response to any blue light content (regardless of CCT). Twenty-nine percent of the spectrum of 4000K LED lighting is emitted as blue light, which the human eye perceives as a harsh white color. Due to the point- source nature of LED lighting, studies have shown that this intense blue point source leads to discomfort and disability glare. Blue-rich white light sources are also known to increase glare and compromise human vision, especially in the aging eye. These lights create potential road safety problems for motorists and pedestrians alike. In natural settings, blue light at night has been shown to adversely affect wildlife behavior and reproduction. More recently engineered LED lighting is now available at 3000K or lower. At 3000K, the human eye still perceives the light as “white,” but it is slightly warmer in tone, and has about 21% of its emission in the blue-appearing part of the spectrum. This emission is still very blue for the nighttime environment, but is a significant improvement over the 4000K lighting because it reduces discomfort and disability glare. The difference in blue light content is just 8%, by the statements made. The same reduction in brightness or blue light emission to the observer can be achieved by reducing illuminance levels by 8%, but the concept of reducing illuminance levels was not addressed. Nowhere in the document are illuminance levels mentioned at all. Further, there is no consideration of suggesting lighting be avoided entirely unless specifically required – which has many benefits. Since the effect of blue content is dependent on the amount of light as much as it is about spectral content – which is the crux of the previously mentioned LRC point. Any recommendation regarding the effect of any light source on observers must also include this important factor. There is a threshold at which the amount of light reaching the observer is so low that there are no detrimental effect, regardless of spectral content. Yet, nothing in the AMA document addresses this, or recognizes it. Glare is glare, with no mention or definition of it. The assertion appears to connect 4000K LEDs to being point sources of high blue intensity and the causing glare, that is mitigated simply by selecting 3000K LED products. This is, of course, absurd, and has no basis in fact or science, as was pointed out in the LRC response. This is an attribution made by both the AMA and IDA. However, CCT and glare are not related issues. Glare is an issue of uncontrolled brightness and contrast. However, one can assume they are attempting to make the case that glare with higher CCT sources carries with it higher effect from blue spectral content, that lowering the CCT for a given amount of glare reduces this. However, that seems a contortion of what was written, as it would assume that glare is inevitable, or a necessary and unavoidable component of LED lighting. This is as absurd as connecting glare to CCT. What is at issue, is the assertion that LEDs can be classified as causing this effect, based solely on their CCT value. Again, this characterization completely ignores Spectral Power Distribution (SPD), which varies widely between LED products at all CCT’s. This is the ubiquitous CCT SPD chart that so many assumptions and decisions are made on. What is missing is CRI and other variables. For example, the 3000K LED in this SPD are 84CRI, while the 4000K is just 70, so this is actually a non-sequitur comparison. This chart was generated from the National Gallery Web site using their data. This shows clearly that it is entirely possible to apply a 3000K LED (red line) and realize greater blue light content than a 4000K source. This comparison is between a 3000K 70CRI source and a 4000K 84CRI source. Note also that any assumption of 456nm as a peak for LEDs is not accurate, as the 3000K source uses a 405nm violet pump – which raises other issues concerning blue and violet light on human visual health. 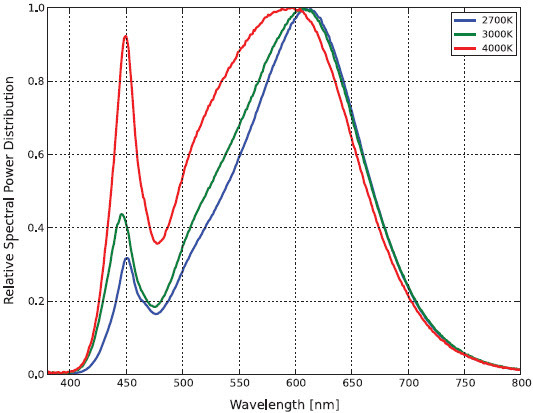 Here are two sources generating identical 84CRI, one at 3200K (red line) and one at 4000K, sharing a similar blue light peak at 456nm, although the content between 456 and 500nm does show further differences. How much this is a concern has yet to be determined. Further, the amount of light in the SPD is just one part of the dynamic -the other critical factor is how much is reaching the observer’s eye, which has nothing to do with CCT. The point here is not to push for 4000K. The point in comparing these sources is to show that using CCT as a surrogate qualification is a faulty and unscientific approach that is being forwarded by the AMA and the IDA. This will lead to abuses, as there is a very real opportunity to produce low quality, low priced 3000K LEDs to serve the market, that have higher than desired blue light in the 456nm peak region. A comparison of sources at 70CRI, from 3000K to 5000K show very little difference in blue light content – making any assumptions of the 3000K being a superior choice based on blue light concerns less clear. Higher CRI usually indicates greater down-conversion from blue pump to the region about 600nm, but is no more a guarantee than CCT in determining blue content. One caveat before we move on. CRI is not enough of an additional qualifier, as the relationship between CCT, CRI and blue light are not assured nor are they necessarily uniform from product to product. In the IDA recommendation, the inclusion of an S/P ratio limit of <1.2 is an attempt to include a more sophisticated approach. Unfortunately, there are few sources available with S/P data provided upon which to make the comparison, and few, if any, customers are going to bother calculating the ratio for themselves. This is the beautiful 3000K SPD that everyone lusts for. Low blue content and full halogen like content in the long wavelength region. Would be great in a park setting. However, this is not a typical SPD of 3000K sources, as it is a >97CRI light source that is not typically used in street lighting, mainly due to cost. disoriented by electrical light and sky glow, preventing them from reaching the water safely. Excessive outdoor lighting diverts the hatchlings inland to their demise. Even bridge lighting that is “too blue” has been shown to inhibit upstream migration of certain fish species such as salmon returning to spawn. One such overly lit bridge in Washington State now is shut off during salmon spawning season. have adopted best lighting practices and now require minimal and shielded lighting. Light pollution along the borders of national parks leads to detrimental effects on the local bio-environment. For example, the glow of Miami, FL extends throughout the Everglades National Park. Proper shielding and proper color temperature of the lighting installations can greatly minimize these types of harmful effects on our environment. This is another case of inferring their recommendation for mitigating blue rich light applies to these cases. In the case of coastal Florida, the solution is to mandate exclusion of white light of any CCT, demanding “Wildlife Safe” color sources – which is amber in color, with zero blue content. The assertion that “Proper shielding and color temperature of the lighting installations can greatly minimize these types of effects…” is simply wrong and misleading. The code for lighting these regions specifically precludes the use of any white light CCT, and prescribes illuminance levels and other factors beyond shielding that are stringent and irrelevant to the case of white light application in the areas addressed by the AMA document as a whole. The “revelation” that observers prefer 3000K light at low illumination levels is not new at all. The Kruithoff Study, completed in 1943 pretty much covered this, and has been re-established many times since, using all types of light source technologies. 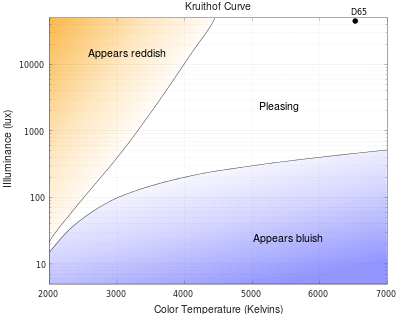 Preference for warmer color at lower illuminance and sensitivity to blue appearance is well established. The real question here is, why the AMA, a basically scientific body, is making the argument for color preference as rationalization for its position on the topic of blue light in public illumination. This approach is argumentative, and subjective, thus has little place in objective recommendations. The inclusion of subjective commentary combined with other areas of confused technical content weakens the AMAs position and exposes it to critique should have avoided with better editing and review. There is nothing wrong with color preference. If communities make that decision based on aesthetic or subjective opinion, that is certainly within their purview. However, creating artificial linkage through convolution and conjectural connection between that choice and other factors, while excluding other factors, such as illuminance levels, or the need for lighting itself, is disingenuous politicking, not objectivity. Myth #1: The use of LEDs reduces light pollution and is “good for dark skies” because they’re highly energy efficient – While LEDs are more efficient, increased application of the technology to expand outdoor lighting offsets the gains made to control sky glow. Myth #2: The use of LEDs reduces light pollution and is “good for dark skies” because they make it easier to control where the light lands on the ground – The issue of uncontrolled glare and blue rich content create light pollution issues offsetting any gains realized by the directionality of the light sources themselves. Myth #3: LED lighting increases traffic safety – There’s no academic evidence for this. Myth #4: LED lighting improves security by discouraging crime – There’s no academic evidence to support this claim, or claims that lighting itself reduces crime. Myth #5: Energy savings from LEDs automatically means a lower carbon footprint, which is better for the environment – If the amount of light being applied remains a constant, this may be true. However, if the use of LEDs expands the use of outdoor lighting, the carbon footprint may be increased. … high pressure sodium lighting (the current standard) has a CCT of 2100K. … High Pressure Sodium has fallen from favor several years ago and is/was being replaced in community after community with Metal Halide for its white appearance and improved color rendering. Conveniently, their is no mention of the common use of MH lamps and their typically 5700K color, and 65CRI performance. some may question where the AMA and blue light concerns were as Metal Halide was proliferated, including replacing HPS and LPS sources on streets and roadways over the last two decades. Metal Halide lamps generate both blue light and damaging UV light in short wavelengths. Yet, the AMA was silent for two decades as this lamp was deployed to replace HPS. Mercury Vapor was far worse, yet caused no reaction at all for half a century in use. To a some degree, it can be forgiven that, based on prior public demand for whiter light to replace the yellow HPS sources, those making decisions on new LED retrofits assumed that a similar 4000K to 5000K color would be acceptable, if not preferable. 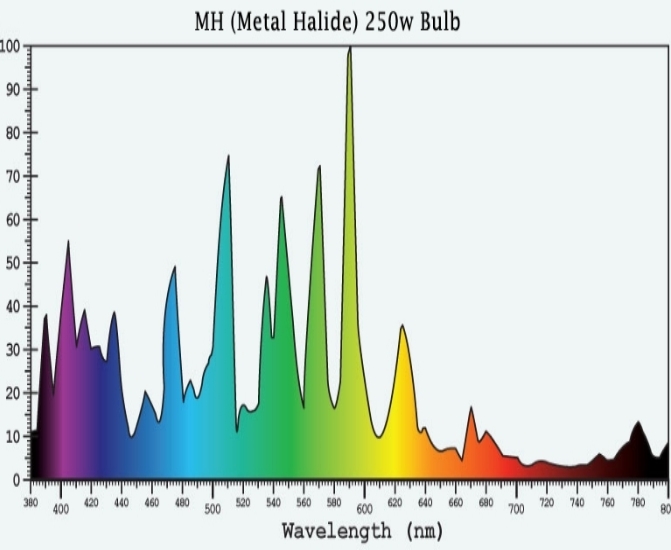 As far as blue light content, MH is hardly innocent of short wavelength emission, and while some don’t seem to know this, prior to LED technology short wavelength light has been a topic of discussion for decades, as has UV light. However, other than incorporating filters on conventional products in a few museum and retail applications, their has been little demand or willingness to pay for blue light mitigation – until very recently. In the early phases of LED deployment, everyone was focused on service life to reduce operational costs (low maintenance), high efficacy to save energy, and low cost to support short payback periods. Utilities and municipalities made their needs known, and manufacturers responded with the products they asked for, which included use of LEDs that met the criteria. 10 years ago, this meant 5000k to 6500K 65CRI LEDs. This was not a scandal, it was simply the state of the art at the time. Nobody was talking blue light content, nor was there any real discussion of SPD’s, so there was not consideration of this by anyone. As the issue of color and blue light emerges, and greater understanding is achieved, this has changed. 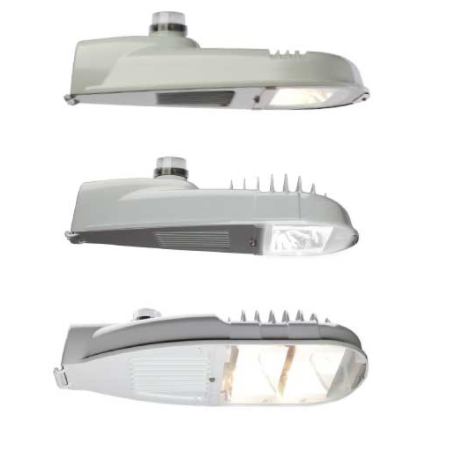 The demand for lower CCT street and roadway lighting products is being met by product manufacturers. This started with the offering of 4000K LED products, and now offerings of warmer color choices, all the way down to 2700CCT. Interestingly, there is little real demand to offer high CCT products, and given history of low CRI sources used in outdoor products, it is widely assumed that 70-80CRI is good enough. There is no scandal or scam here. Manufacturers simply provide the market products the market demands, and are reacting to these demands, as they should. The AMA document is a compilation of solid well known information that is being addressed, with subjective commentary that has no place in a scientific organizations policy statements, and numerous errors regarding lighting science and non-sequitur comparisons that have resulted in a backlash reaction by experts who see this disregard for accuracy as an affront. Additionally, there are far too many non-lighting professionals proclaiming themselves experts in lighting. This, coupled with the amplification effect of social media that gives them voice on topics they have no real understanding of, coupled to organizations like the AMA issuing recommendations on lighting, with no involvement of the IES, LRC, CIE, or any other lighting focused organization, results in controversy. This gets into the heads of decision makers and lighting customers, and results in silly local codes that can actually result in poorer performance than is intended by the organization issuing such policy statements. The idea being forwarded that lighting manufacturers represent the entirety of the lighting industry and community, that anything they do is done with the approval and endorsement of lighting professionals is a common fallacy. Lighting manufacturers are responsible to their owners and shareholders. They meet customer demands to this end. If a customer asks for a product to be painted pink with orange stripes, manufacturers break out the pink and orange paint and satisfy that demand, for a profit. If the customer asks for the cheapest, most efficient luminaire, manufacturers build that product. It is not the responsibility of manufacturers to demand customers rationalize their choices. Further, if industry knowledge evolves and changes, or new research and findings emerge, manufacturers and lighting industry experts cannot be retroactively held accountable for meeting prior demands. This topic is over-blown, and being distorted by hysterics and inaccuracies that will take years to clear up. Blended into this is a propensity to mix observer color preference with research on blue light hazards not related to the wavelengths in discussion, and the issue of circadian entrainment and melatonin suppression – topics that most lay-persons do not fully understand for good reason – the experts have not yet come to any hard conclusions on many of these topics… yet. Why the amateur lighting “experts” insist they have all the answers and believe there is some mass scam involved in the deployment of new lighting technologies, apparently with no concern for humans, is a mystery to those who live, breath, and make their living from lighting application and design. I personally agree that street and roadway lighting looks better at low levels, and at warmer color temperatures. 3000K causes me no real concern, especially now that the efficacy of warm CCTs has increased to eclipse most conventional products, including MH and low wattage HPS. However, I can also make a case for 4000K with the right SPD and at the right illuminance levels, as an attractive solution, although with so little real difference that it may not be worth arguing, assuming a proper specification for CCT, SPD, illuminance levels, glare and brightness are established at a lower CCT. What concerns me is that issuing a blanket policy based solely on CCT, with no other metric qualification, will result in predatory behavior of unscrupulous manufacturers, who will incorporate low performing 3000K LEDs with more blue light than the higher CCT products everyone has concerns over, to realize a performance advantage and reduce costs. there are more than a few dozen low-grade products imported into the USA of questionable quality, that will continue to serve the market’s desire for cheap – exploiting any gaps and errors in specification or standards writing. Further to all of this, I find the confusion of optics and color troubling, and the over-generalization of LED characteristics frustrating. These issues should be redacted and re-written to eliminate the conflicts, as they just make the authors look uninformed, which devalues the document to a large segment of the population that will ultimately produce the designs and products to satisfy its recommendations. I find the majority of LED outdoor area lighting to be offensive. The exposed multi-LED arrays focused into zones to gain uniform distribution (an admirable endeavor), are a horror study on glare. There are a few products that mitigate this to some degree, but there is a lot more to be done. I have also seen optical designs that produce excellent photometric results, very controlled brightness, with controlled cutoff and glare control – but they are not yet in commercially available product. The GE Evolve with current gen optic that uses reflectors to spread and conceal light sources is a small step in the right direction. More is needed. This issue is also apparent in parking garage and petrol industry canopy lighting, where glare is even more harsh and painful. Where a decade ago the focus was on delivering the lumens needed, at an affordable cost, with high efficacy, I propose that the issue today is down to one significant and massive issue – GLARE control. I believe that there is more objection to the brightness, offensive optics that exposes arrays of LEDs, and apparent disturbing glare of LED area lighting than any other issue. While CCT is certainly going to be a preference issue, and the movement toward 3000K +/- is as valid as any other, if glare is not addressed, the complaints and concerns will continue to cause resistance to LED technology. I feel for anyone who has to live with the common LED area lighting products, with the arrays of hot little sources acting like little lasers into the eyes of observers. On this topic, no matter how mangled the AMA has made the case, I agree with them completely. LEDs are, as they state accurately, point sources with very high intensity. While this has nothing to do with CCT, it is the source of glare when that intensity is not diffused or controlled properly. Manufacturers of outdoor area, petro canopy, flood, street and roadway lighting need to invest considerable effort addressing the disturbing propensity of LED lighting products to be horrific glare bombs. Exposed simple optics are not cutting it. Manufacturers of LED packages need to address the issue of blue light content in products specifically designed for outdoor use. A small sacrifice in CRI (TM3o Rf, whatever), to address the “blue rich” content issue will be worth its weight in gold. The resulting LED need not be applicable to interior general illumination, and may be visibly “less white” than interior lighting. Lighting manufacturers and LED package makers need to work together to solve the issues of optical design and brightness. This may come from use of more lower output sources in tight arrays that appear more uniform in brightness, or from sources of very high intensity to be used within reflector systems that conceal the source from view. Lighting professionals need to stop ignoring this issue and start showing up to public hearings to assist in proper, objective, well founded decision making. Further, the lighting professional community needs to continue and redouble its work on resolving the many unknowns and subjective assumptions now in place that are causing outside influences to feel they need to jump in an take a stand. I give the AMA credit for throwing this issue into the face of the lighting industry as a whole. Designers need to take notice and get more involved addressing the issues brought forward, and manufacturers should take note that the days of bright blue glare bombs is coming to an end. The market is going to demand better. Nothing like having an outside organization step on a few toes to get the discussion going. Perhaps, even if the AMA document is proven to be generally reductive, simplistic, inaccurate, and overly alarmist regarding actual blue light effects, the impact of its release will cause others to respond by addressing its most salient concerns. If this leads to less glare, lower apparent brightness, reduced illuminance levels, higher visual acuity for us old folks, reduced impact on sky glow, lower impact on animals, the end of low CRI / high CCTs (5000K+), and less offensive fixture designs overall… we all win.